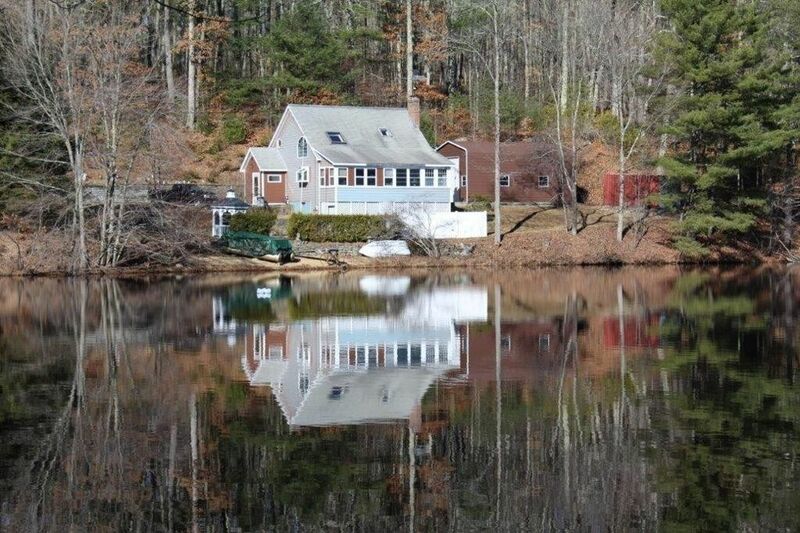 Enjoy both summer and winter in this waterfront Cape on beautiful Brooks Pond with private beach and gorgeous views. This year round home was built in 1995 with two bedrooms, two baths, cathedral ceiling in kitchen and 28' waterside enclosed porch for dining, relaxing and enjoying lake views. Partially finished walk-out basement with heat and wood stove. Back-up generator, updated boiler, oil tank, air conditioner/heat pump and some replacement windows. Extended water frontage with nice beach area, gazebo, small lawn, patio and dock. 24' x 30' steel garage/barn with 12' door. Brooks Pond Conservation Association owns the pond and public beach area. A beautifully peaceful pond which touches 4 towns with numerous islands and great fishing holes. Limited public access with gas boat motors, jet skis, ATV, snow mobiles and gas ice augers prohibited. Enjoy your morning coffee on the easterly facing waterfront porch and swim from your own beach.